We had our first ever online webmaster chat in February '08 to answer your top questions, and followed it up with three more. They have been incredibly successful, and we're planning for more this year. We'd like to send a special thank you to our Bionic Posters, who have played a huge part in supporting our growing community. Localization has been a big focus for us, so we launched our blog and Help Center in additional languages, and made Webmaster Tools available in 40 languages. We hope this makes it easier for people in other parts of the world to adopt our tools and gain a better understanding of how search works. We launched a new Help Forum in English and Polish, with a broader rollout planned in other languages this year. Our SEO starter guide was released and it has been one of our most successful articles to date. We placed an emphasis on sharing material via YouTube and created seven video series totaling two hours of content. We kicked off '09 with a bang on the video front with Matt's "Virtual Blight" presentation. We launched GData APIs and iGoogle gadgets, allowing end users to access their data outside of Webmaster Tools in a way that makes sense to them. Managing a robots.txt file can be complicated, especially for first time webmasters, so we launched a robots.txt generator. In our effort to be more transparent and proactive, we enhanced our Message Center to send out messages such as the infinite spaces and hackable site warning notifications. To simplify the process of getting up and running on Webmaster Tools, we launched the Webmaster Tools Access Provider Program. To reduce frustration felt by users when trying to access a URL which does not exist on a site, we created a 404 widget. We enabled webmasters to view details of "404 Not Found" crawl errors. Sitemaps keep getting better, including integration with Custom Search Engine and simplified submissions. Thank you once again and we hope for another exciting and eventful year! Select the "Playlist gadget," and Friend Connect will automatically generate a snippet of code for you to copy-and-paste into your website's HTML. While you're there, you may also consider adding the "Wall gadget"—music can be a great conversation starter! This iLike gadget is fully integrated with your existing Friend Connect account, so you can edit your website's playlist, moderate wall posts, and manage membership all from a single interface. Like all of the social applications that work with Friend Connect, iLike's application is built using OpenSocial, and it's a great example of how a social application can foster a sense of community around a website. Any site using Friend Connect can host gadgets created by the OpenSocial developer community. If you're a site owner who wants to begin adding social features to your website, visit Google Friend Connect. No programming is required! If you're a developer interested in building a social application to run on the tens thousands of websites that are now using Google Friend Connect, learn more at www.opensocial.org. As you're building your site, you may be looking for a simple way to provide fresh content that captures the attention of first time visitors and loyal users alike. They say that music brings people together, so what better way to engage your visitors than by inviting them to help build a unique, collaborative soundtrack for your website? Now, social application creator iLike has built a special version of their social playlist gadget for sites using Google Friend Connect. iLike's playlist gadget lets you and your visitors shape the site's "musical footprint" as a group. With this application, anyone visiting your website can listen to songs on the playlist, and if they sign in using Friend Connect, they can add their own favorites to the list. Of course, you can also add songs to the playlist, and as the site administrator, you have the ability to remove songs or change the order. If you already have Friend Connect running on your website, you can add some musical flair in a matter of minutes with just a few clicks. Sign in at www.google.com/friendconnect, click "Social Gadgets," and you'll find the iLike "Playlist gadget" in the gallery. Verifying that you own a site is the first step towards accessing all of the great features Webmaster Tools has to offer, such as crawl errors and query statistics. The Google Sites and Blogger teams have worked hard to make site verification as simple as possible. In the following videos, I'll walk you through how to verify sites created in Google Sites and Blogger. These videos are available in our Help Center if you have additional questions about verifying a Google Site or Blogger blog with Webmaster Tools. And as always, you can find me and many other Googlers and webmasters in our Webmaster Help Forum. Note: Verification of Blogger blogs in Webmaster Tools has changed significantly. Please see the more recent blog post "Verifying a Blogger blog in Webmaster Tools" for more details. to help webmasters create better Sitemap files. While most Sitemap generators either crawl websites or list the files on a server, we have created a different kind of Sitemap generator that uses several ways to find URLs on your website and then allows you to automatically create and maintain different kinds of Sitemap files. In addition, Google Sitemap Generator can send a ping to Google Blog Search for all of your new or modified URLs. You can optionally include the URLs of the Sitemap files in your robots.txt file as well as "ping" the other search engines that support the sitemaps.org standard. Sending the URLs to the right Sitemap files is simple thanks to the web-based administration console. This console gives you access to various features that make administration a piece of cake while maintaining a high level of security by default. 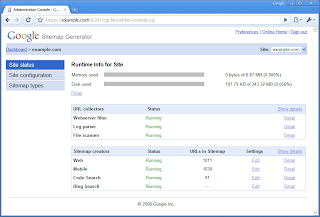 Google Sitemap Generator is a server plug-in that can be installed on both Linux/Apache and Microsoft IIS Windows-based servers. As with other server-side plug-ins, you will need to have administrative access to the server to install it. You can find detailed information for the installation in the Google Sitemap Generator documentation. We're excited to release Google Sitemap Generator with the source code and hope that this will encourage more web hosters to include this or similar tools in their hosting packages! Do you have any questions? Feel free to drop by our Help Group for Google Sitemap Generator or ask general Sitemaps question in our Webmaster Help Forum. It's been well over three years since we initially announced the Python Sitemap generator in June 2005. In this time, we've seen lots of people create great third-party Sitemap generators to help webmasters create better Sitemap files. While most Sitemap generators either crawl websites or list the files on a server, we have created a different kind of Sitemap generator that uses several ways to find URLs on your website and then allows you to automatically create and maintain different kinds of Sitemap files. One of the things I'm thinking about in 2009 is how Google can be even more transparent and communicate more. That led me to a personal goal for 2009: if I give a substantial conference presentation (not just a question and answer session), I'd like to digitize the talk so that people who couldn't attend the conference can still watch the presentation. You can also access the presentation directly. By the way thanks to Wysz for recording this not just on a shoestring budget but for free. I think we've got another video ready to go pretty soon, too.